joy magnetism: Way to go, Big Red! Woot! Finally caught up to the real-time magnet count! Yay! Ironically, I'm using this magnet to belatedly congratulate the Cornell Big Red for making their first-ever Sweet 16 appearance in the NCAAs, even as I'm still not acknowledging post-season basketball in 2010. Anyway, way to go, Big Red! 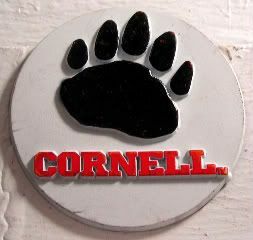 I bought this magnet during a trip upstate, where we packed in a fun sidetrip to Cornell University. Picked this one for today because it's my friend's birthday, and she's a Cornell alum. Just like @earlyshowdave, my cuteboy David Marshall Price! Anyway, so here's where I was going to do a magnetpost about how the adorable little paw print here was because the school's mascot originated in 1916, having to do with the $25 the football team raised to buy a bear cub so adorably named Touchdown. I dunno how they went from a little black bear to a big red bear, but we'll go with it. Because then I got distracted by the alma mater just below the mascot story. I thought instead of singing Happy Birthday, Dear Gin, I'd post the alma mater instead. So here it is, the Cornell alma mater, as sung by the Cornell glee club. But. Here's why I got distracted. I listened to the above, and couldn't help but think of this, the UNC alma mater as sung by the UNC glee club. So I have to ask...are all schools singing the same five alma mater tunes, just with different words? Did all the schools' founding fathers get together and just decide to use these same tunes? Is it in the How to Set Up a University handbook? Is there some sort of rule? Do universities have the same tune and colleges have a different one? Is there a wiki page that explains it? Goodness. My world is askew. Kinda like when we went to England in high school, and at the Royal Tournament at Earl's Court, they played God Save the Queen. While the entire class sang...My Country Tis of Thee. Sigh. It takes a birthday and YouTube to knock my world off its axis. Hope you're happy, Gin.